Markus Eberhardt is Assistant Professor in the School of Economics at the University of Nottingham. Markus’ research focuses on productivity analysis at the macro and micro level, including the development and application of novel empirical methods. Other current research interests include the debt-growth nexus, structural change in low-income countries and gravity equations in international trade. He is currently working on ESID’s project on political economy determinants of economic growth. Eberhardt, M. and Vollrath, D. (2014). ‘Agricultural technology and structural change ’. Oxford CSAE Working Paper WPS/2014-21. Eberhardt, M. and Teal, F. (2013). ‘Structural change and cross-country growth empirics’, World Bank Economic Review 27(2), 229-271. Visit Dr Markus Eberhardt’s personal website. 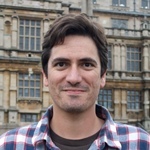 See his staff profile at the University of Nottingham.